In the case of Thameslink, 86 four-car Class 319 dual-voltage EMUs built between 1987 and 1990 have been replaced by new Siemens Class 700s over the last three years. Most 319s have recently been refurbished and fitted with controlled emission toilets, passenger information systems and PRM-TSI compliant accessible toilets to keep them in service beyond December 2019. Wabtec’s biggest engineering challenge was the new electronic control cubicle, which controls local power on the driving cars. Originally, much of the fleet was expected to switch to GWR’s Thames Valley commuter operation, with others moving to Northern. The curtailment of Great Western main line electrification and GWR’s decision to buy new Class 387 EMUs for the remaining electric services left more than 60 ‘319s’ without work beyond 2018. This project started as far back as 2014 when, inspired by the Bombardier/Network Rail Independently Powered Electric Multiple Unit (IPEMU) experiment – which saw batteries fitted to a Class 379 EMU – Porterbrook challenged its engineering team to create their own IPEMU concept, using Class 319s. At that time, the Government was still committed to a rolling programme of electrification, but many routes were still unlikely to be wired – even in the longer term. Only 42% of the British rail network is electrified, compared to anywhere between 50% and virtually 100% in mainland Europe. Spotting an opportunity for a flexible train that could take advantage of the gradually increasing electrified network and operate under its own power elsewhere, Porterbrook started to investigate the options for trains that could easily, and reliably, switch between an external power supply and an on-board energy source. Helen Simpson, innovation and development manager for Porterbrook, was there at the beginning. She says: “We looked at diesel engines, batteries, supercapacitors (electrical storage devices capable of providing a short-term boost of energy), hydrogen and flywheels, but only diesel offered the high-energy density, good range and proven capabilities we were looking for. Simon Evans, group innovations director at Wabtec Faiveley UK, which owns the Brush Traction works in Loughborough, was also there from the start of the project. “For us it was, and is, an investment in the future. We think it has ‘legs’. 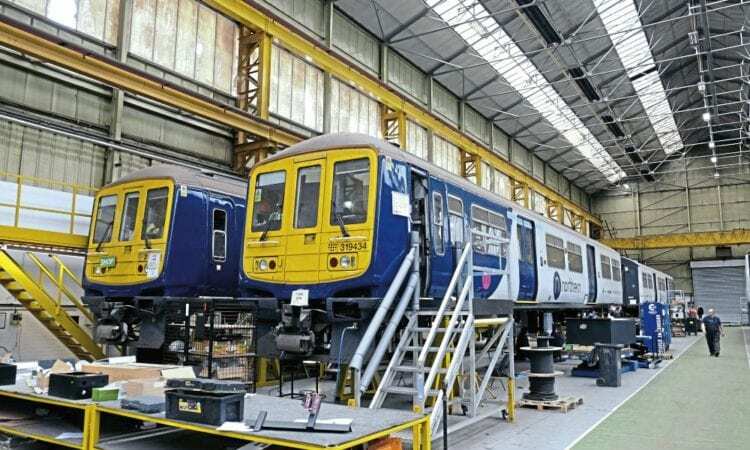 Not only does it present opportunities for similar modifications of other fleets, it is also creating an engineering base for other projects, and developing engineering expertise in the UK.” Appropriately, given the flexibility the new train could offer, it was soon branded ‘Flex’ by the team. “We had to run numerous computer models for ‘Flex’ to see if it would perform as required with a passenger load on the various routes and schedules it might be asked to work,” added Helen. The new engine rafts feature a power pack with a MAN D2876 390kW diesel engine and an ABB alternator. The design of the raft is similar to that used on Bombardier ‘Turbostar’ DMUs and is designed to be removed or installed quickly with the assistance of a special lifting platform. Simon explains: “The MAN engines have a rail pedigree and are compliant with Stage IIIb emissions rules. Their maximum rating is 390kW, but we decided to have them working at less than that to give ourselves some ‘headroom’. Looking more like Class 150 vehicles after the installation of exhaust stacks on their inner ends for the new diesel power packs, Nos. 77356 and 77448 are prepared for their new role at Loughborough on June 19. For comparison, each Class 150 vehicle has a 213KW (285hp) Cummins diesel engine, delivering 570hp for a standard two-car set. Simon continues: “A 319 body is almost identical to a Class 150 so we knew the diesel components and exhaust systems would fit, although the positioning of some of the existing electrical equipment resulted in some convoluted exhaust runs. Other modifications include new electronics cubicles and two ethernet communications buses running the length of each train. Helen explains: “The two engines have to ‘talk’ to each other so we added two ethernet connections, one for wi-fi and PIS (passenger information system) and one for traction. The existing train control wiring has also been retained. However, to keep things as simple as possible in the driving cabs, extra equipment is limited to new fire warning and engine stop buttons. This should make conversion courses relatively straightforward for drivers already working on Class 319s. Once passed for service, the bi-mode Class 769s will still be able to work in multiple with their dual-voltage Class 319 sisters. Helen and Simon also say the ‘769s’ should be generally quieter than Class 15x ‘Sprinters’ because the power pack is largely enclosed and separated from the floorpan by two sets of substantial rubber mountings that will absorb vibration. Another advantage of ‘Flex’ trains is they are able to ‘get home’ by switching to diesel power if the overhead supply fails, reducing the impact of delays caused by infrastructure failure. It’s widely known the project is running some months late. 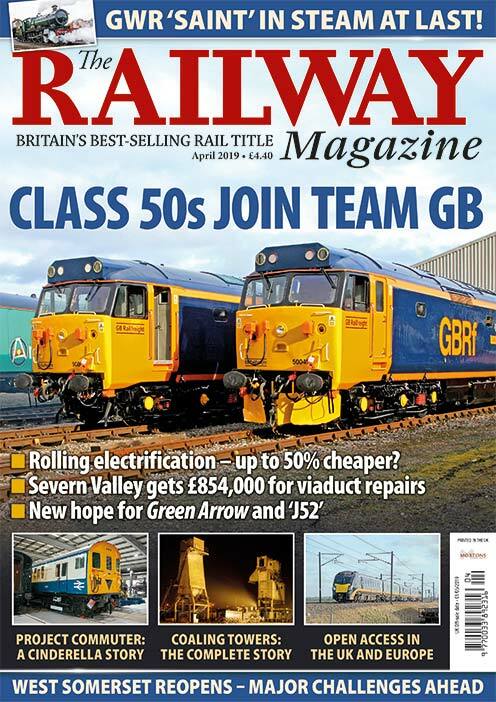 The first Arriva Rail North Class 769s should have entered passenger service in May 2018, but as this publication went to press the first set was being prepared for initial dynamic testing at the Great Central Railway, close to the Brush factory in Loughborough. What challenges did the team face in converting these trains into bi-modes? Simon interjects: “Our biggest engineering challenge of the whole project was the new electronic control cubicle, which controls local power on the driving cars. All the new integration control electronics and electric systems were designed in-house by Brush – we don’t buy them in and bolt them on. He adds: “For this project we had three stakeholders – Porterbrook, Arriva Rail North and the Department for Transport (DfT) – which could have been problematic. However, we have had very clear communications across all departments, from operations to engineering, and all have been involved to inform the design process and changes throughout. “Our biggest engineering challenge was the new electronic control cubicle, which controls local power on the driving cars. “For example, the maintenance team suggested a change to the filling arrangement of the AdBlue (an aqueous urea solution which reduces harmful emissions from diesel engines) filler to ensure it is the same as the new CAF Class 195 DMUs at depots. There will always be compromises, but the key is to find a balance that keeps as many people happy as possible. Helen continues: “We have had to fit a track circuit actuator [TCA], which turned out to be much more complex than anticipated, and a fire barrier, but otherwise there haven’t been too many unexpected horrors! “For a build of their era, the Class 319 fleet is remarkably standard, but there are minor technical differences between the ‘319/3’ and ‘319/4’ and the four sub-fleets created since. In total, more than 60 engineers have spent more than 60,000 hours on more than 2,500 drawings, developing more than 3,500 components for the ‘Flex’ conversions. 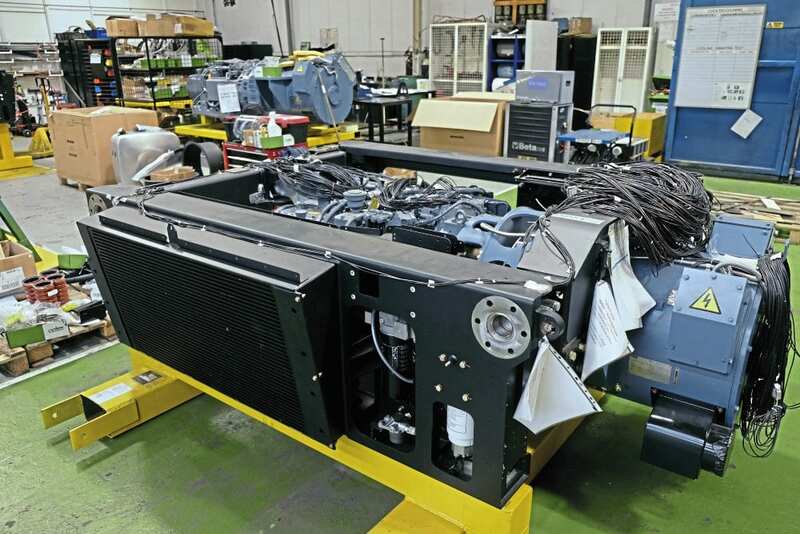 The pre-production engine rafts have spent hundreds of hours on a specially constructed test rig at Loughborough and every production raft will be ‘shaken down’ on the same rig before it is installed on a train. The tests take the engines through a full cycle, including taking them beyond their notional maximum output to ensure they have the capacity to deal with power surges. 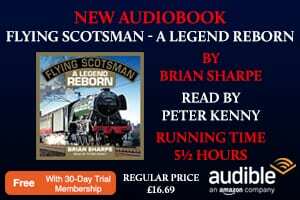 However, in service the engines will ramp up to a steady speed and run at a fixed rate, supplying electric current for the traction motors via the alternator. As diesel engines are ‘happier’ when running at a constant rate, this should ensure better reliability, longer engine life and greater efficiency than the constant powering up and down experienced by standard DMU engines. An initial order for eight ‘Flex’ sets from Arriva Rail North in December 2016 was followed by five for Arriva Trains Wales in July 2017 (Wales & Borders from October 2018), an order which has an option for a further four sets. Once development and testing is complete, the whole conversion process – and the engine raft assembly in particular – is designed to be easy to ‘productionise’. This should mean Northern and Wales & Borders (W&B) receive their sets during 2019, adding extra capacity and, in the case of W&B, releasing Class 150/2s for PRM-TSI modifications. Next to opt for ‘Flex’ was Great Western Railway, which placed an order for 19 tri-mode (25kV AC, 750V DC third-rail and diesel) trains for Thames Valley local services and the Reading to Gatwick route in early-2018. 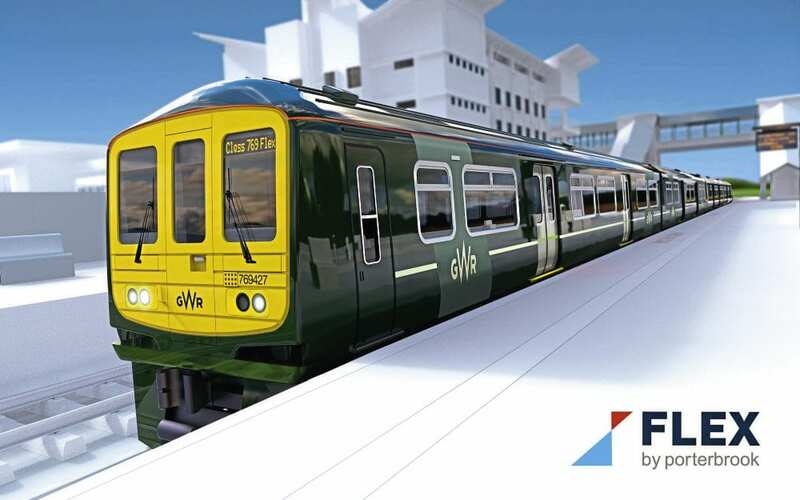 These trains will have a higher specification than their sisters with air-cooling equipment and upgraded interiors, as well as the unique ability to operate on non-electrified lines, 25kV AC overhead on the Great Western Main Line and the Southern Region third-rail network. The first set is expected to appear in 2019, replacing Class 165/166 DMUs and freeing GWR Class 387s for their new role with Heathrow Express. Knorr-Bremse at Wolverton has been contracted to refurbish the trains. Will the trains deliver what operators require of them? Helen says: “Our target for diesel operation was a 500-mile range, but we expect them now to manage 700-800 miles, which should mean they can run for two or three days before they need refuelling. 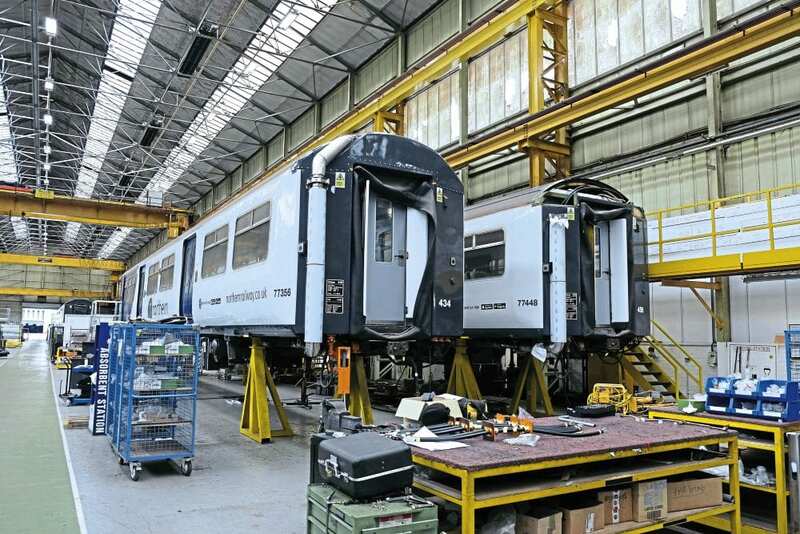 After testing at the Great Central Railway in August, the first ‘Flex’ set will venture out onto the main line for further dynamic testing at higher speeds as part of the approvals process. Currently, it is hoped the first trains will enter passenger service with Northern on the Manchester Airport to Windermere route in December. Looking further ahead, Porterbrook is keen to develop the ‘Flex’ concept and create more bi-mode trains for a variety of uses. With modern DMUs continuing to be in high demand, the leasing company is hopeful it will be able to find new homes for much of the Class 319 fleet – many of which are now in storage. Porterbrook is keen to emphasise ‘Flex’ is not limited to passenger duties, and it is working with partners in the intermodal freight business to develop ideas for lightweight, high-speed freight and parcels trains. Taking advantage of their go-anywhere, bi-mode capability, converted Class 319s with internal racking could be a useful tool for freight companies wanting to tap into the increasingly important high-value overnight parcel business. The leasing company is also working with the UK Rail Research and Innovation Network (UKRRIN) to develop ideas for ‘convertible’ vehicles fitted with seats designed to concertina, creating space for parcels, luggage and cycles, as demand dictates. Looking beyond the ‘319s’, Porterbrook is also examining possibilities for the South Western Railway Class 455 EMU fleet, which will be replaced by 2021. The modernised SWR ‘455s’, which received Vossloh-Kiepe AC traction packages in 2016/17, are likely to find new homes elsewhere on the third-rail network, but are viewed as good candidates for conversion to self-powered or bi-mode operation. Interestingly, Porterbrook is also hinting at the possible conversion of some Southern Class 377 EMUs into bi-mode trains to replace Class 171 DMUs on the London to Uckfield and Ashford to Hastings routes. 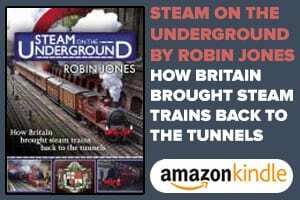 However, as this fascinating story develops over the coming years, it is good to see a leasing company prepared to invest in British engineering and innovative home-grown technologies to prolong the lives of trains that might otherwise be heading for the scrapyard.